Greenhouse automatic vent openers are really quite necessary for anyone who is short on time. They are one of the simplest products for greenhouse automation. Instead of walking out and opening and closing your vents every day, it will be done when needed for you. Warm air rises. 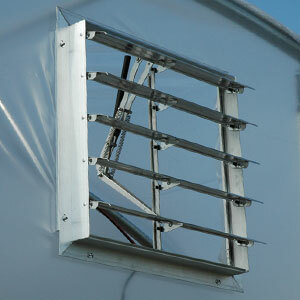 Opening your roof vents is one of the easiest ways to vent hot air out of your greenhouse. Although, during the hottest months of the year, this alone will probably not be sufficient to cool your greenhouse. You will probably need an electric ventilation system and probably a shade cloth. These openers have a wax cylinder inside of them. They are based on contraction and expansion. When the wax gets hot, it expands and pushes the greenhouse automatic vent openers to the open position. When the wax cools, it contracts and pulls the vents close. 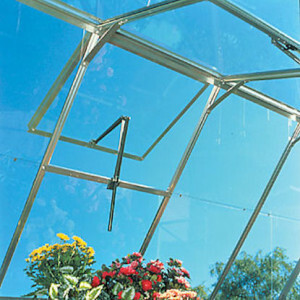 They are installed with several screws into your existing greenhouse frame. You simply replaced your manual vent arm. No batteries or electricity required. One year warranty, average life is several years. The wax cylinder may be replaced without replacing the entire arm. These arms may be set to open between 62 and 77 degrees F. They have a thumbscrew at the end of the opener for adjustment. You may need to adjust these for several days to get them to open at the desired temperature. These vents are only meant to open a roof vent under 17 pounds. These may be retrofitted to your greenhouse, but take our suggestion and purchase this valuable accessory at the same time as your greenhouse. $69.99 including FREE SHIPPING to Contiguous US.Sorry, no longer available. Replacement Cylinder (specific to this opener). Sorry, no longer available. Looking for a shutter with a solar powered opener? You can find it here.